Compared to other LGBT-friendly resorts in the Northeast, sophisticated but laid-back New Hope and its appealing Jersey neighbor Lambertville are restful and romantic weekend hideouts for couples. This quaint, artsy hamlet is a mere hour from Philadelphia and 90 minutes from New York City, but the hectic bustle of either city is decidedly absent. Tiny and scenic New Hope sits on the west bank of the Delaware River, just across from Lambertville, NJ. The borough of New Hope is one of some small villages on either side of the Delaware, just three miles north of Washington Crossing Historic Park, which commemorates George Washington's crossing of the Delaware River in 1776. Most visitors to New Hope, a popular weekend destination for Philadelphians and New Yorkers, arrive by car. But New Hope is also easily accessible from any of the major airports serving Philadelphia and New York City. You could rent a car from any airport and drive here, but there's also Trans-Bridge Lines daily bus service between New Hope and Newark Airport, New York City, and JFK Airport. From Philadelphia and its airport, you can take SEPTA regional rail service to Doylestown, where you can take a taxi the 10 miles to New Hope. 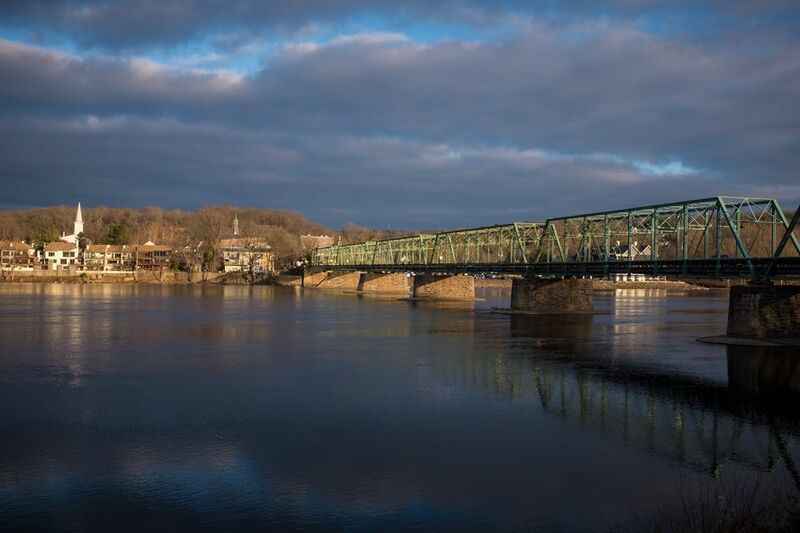 Visitors will want to check out the shops and cafes in New Hope village and across the river in Lambertville. New Hope also is an excellent base for interesting side trips. In addition to Washington Crossing Historic Park, which celebrates the region's crucial role in the Revolutionary War there's historic Peddler's Village, a community of some 70 restaurants and specialty stores, and in nearby Doylestown is the James A. Michener Museum of Art. New Hope is the name of one small town but also what many visitors call the surrounding region, comprising several rustic Pennsylvania and New Jersey communities in the Delaware River Valley. It's a land of wooded estates and horse farms, winding rural roads, restored canals and towpaths, and villages of antiques shops and cafes. New Hope has a highly festive and popular Pride festival, which takes place in mid-May. There's been an LGBT presence in the area for decades, mostly on the Pennsylvania side of the river, dating back to when New Hope developed a following as an artists' community. The actual village of New Hope itself is tiny - roughly one square mile of preserved 18th- and 19th-century buildings, most of them now inns, restaurants, shops, and private homes. In the 1930s and 1940s, the area began to draw musicians and writers, many of them from New York City, including Dorothy Parker, S.J. Perelman, Oscar Hammerstein, Moss Hart, and Pearl Buck. The opening of the Bucks County Playhouse in 1939 precipitated a gay presence in town. Built in the rustic shell of Benjamin Parry's old 18th-century grist mill, the theater brought New Hope a regular summer tour of actors and stagehands, many of whom began settling here for at least part of the year. The theater reopened in 2012 following a major renovation.